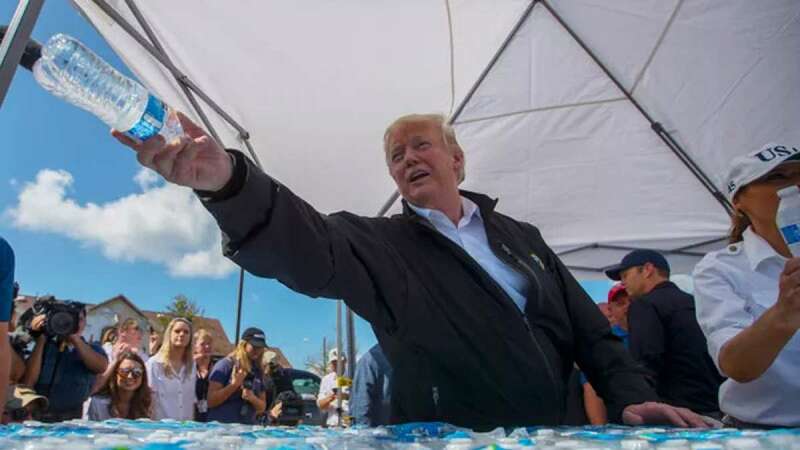 Washington : US President Donald Trump undertook an aerial survey of areas in Florida devastated by hurricane Michael and said that the priority of the his government was to provide food, electricity and safety to the victims. Accompanied by his wife Melania, Trump on Monday arrived at Eglin Air Force Base in northwest Florida, some 130 km east of Panama City, one of the areas most heavily affected by Michael's high winds and storm surge, reports Efe news. At least 19 peoplewere killed as a result of Michael's passage across Florida and other southeastern states last week. Trump declared the Florida and Georgia counties affected by Michael to be disaster areas, thus freeing up federal funds to repair the damage and take care of local residents. In Florida, the President boarded a helicopter to aerially survey Panama City and the nearby town of Mexico Beach, where the storm made landfall on October 10 with 250 km/h winds that destroyed practically the entire community, along with Lynn Haven, continuing his tour in the neighbouring state of Georgia. Thousands of trees have been uprooted in the area, along with many homes ripped from their foundations or with their roofs blown off and now covered with blue tarpaulins. There is trash and debris everywhere and long lines of moving trucks to be seen along the roadways, according to reporters who accompanied the president on his aerial tour. Trump also flew over the nearby Tyndall air base, also damaged by Michael, which brought a storm surge to the Gulf Coast of up to 14 feet. The President seemed surprised that some homes had been completely obliterated, saying: "You know, many of these people have no trace of a home. You wouldn't even know it. It just got blown right off the footing." Trump was welcomed at the scene by Florida Governor Rick Scott, whom he praised for doing an "incredible job", and he toured the zone with Homeland Security Secretary Kirstjen Nielsen, White House Press Secretary Sarah Huckabee Sanders and her father, former Arkansas Governor Mike Huckabee. The presidential party was also welcomed by Federal Emergency Management Agency director Brock Long and Florida Congressman Matt Gaetz, among other civilian and military authorities. The President praised Scott and emergency personnel for responding quickly to the storm. The governor had declared a state of emergency last week in 35 Florida counties and deployed at least 4,000 members of the state National Guard to help with rescue tasks, along with food and water distribution. According to the Poweroutage.us Web site, some 250,000 families and businesses remain without electricity in Florida, North Carolina, Virginia and Georgia.